Bivins, Chambers, and Weyls engaged in a 2-day central Indiana crime spree. They shoplifted blue jeans at gunpoint from a Lafayette Lazarus. They then drove to a Holiday Inn in Lebanon, forced their way into a guest's room, robbed him, stole his vehicle, and left him tied to the bathtub. Heading back toward Lafayette, they stopped at a rest stop north of Lebanon, and robbed Reverend Radcliffe at gunpoint in the restroom. After taking his wallet, Bivins turned Radcliffe around into a stall and shot him in the head. Later, Bivins said he did so "because he wanted to know what it felt like to kill." Full confessions followed. After losing direct and PCR appeals, Bivins waived federal appeals. Bivins v. State, 642 N.E.2d 928 (Ind. 1994). Bivins v. State, 650 N.E.2d 684 (Ind. 1995), Cert. denied 116 SCt 783 (1996). Bivins v. State, 735 N.E.2d 1116 (Ind. 2000). Bivins v. State, 741 N.E.2d 1196 (Ind. 2001). EXECUTED BY LETHAL INJECTION MARCH 14, 2001 01:26 A.M.
Trial: Information/PC for Murder filed (04-11-91); Amended Information for Death Penalty filed (04-26-91); Voir Dire (02-25-92, 02-26-92, 02-27-92, 02-28-92, 02-29-92); Jury Trial (02-29-92, 03-02-92, 03-03-92, 03-04-92, 03-05-92, 03-06-92); Verdict (03-07-92); DP Trial (03-07-92); Verdict (03-07-92); Court Sentencing (06-05-92). Dickson Opinion; Debruler, Givan, Shepard, Sullivan concur. 12-18-95 PCR Petition filed; PCR denied by Special Judge James T. Detamore on 03-21-97. Appeal of PCR denial by Special Judge James Detamore. Conviction Affirmed 5-0; DP Affirmed 5-0. Sullivan Opinion; Spehard, Dickson, Boehm, Rucker concur. (Order of Indiana Supreme Court denying rehearing of decision, and setting execution date. BIVINS WAIVED THE REMAINDER OF HIS APPEALS TO FEDERAL COURT AND WAS EXECUTED BY LETHAL INJECTION ON 03-14-01 AT 1:26 AM EST. HE WAS THE 78TH CONVICTED MURDERER EXECUTED IN INDIANA SINCE 1900, AND 8TH SINCE THE DEATH PENALTY WAS REINSTATED IN 1977. State officials are moving ahead with plans to execute a man who has said he will not seek a federal appeal of his death sentence. An internal committee of the Indiana State Prison met with Gerald Bivins on Monday to find out who he wants as a spiritual adviser, whether he wants anyone to attend the execution shortly after midnight March 13 and what he wants for his last meal. Bivins will hold a news conference on Thursday. Bivins was convicted of killing the Rev. William Radcliffe on Jan. 16, 1991. Bivins shot Radcliffe in a restroom at a rest area along Interstate 65 near Lebanon. Radcliffe, who had just resigned as pastor of Badger Grove Community Baptist Church in rural Brookston, was filling water jugs for his overheated car engine. Authorities called the murder a thrill killing, but Bivins said he killed the minister only because the victim had recognized him during a robbery. "I'm not trying to excuse it. Honestly, I don't think that makes it any better than one who did it to see what it feels like," Bivins had previously said. In a final statement, Bivins said "I wish to apologize to the victim's family for the pain I have caused and the pain I have caused my family and friends and I ask that they, who did this to me, be forgiven." March 14, 2001 - INDIANA - Gerald Bivins, who murdered a clergyman at an Indiana highway rest stop 10 years ago, was put to death by lethal injection on Wednesday after consuming a final meal cooked by his mother, prison officials said. Bivins' mother attempted suicide at her hotel shortly after sharing a last meal with her son at the prison, according to Department of Corrections spokesperson Pam Patterson. Jeanne Bivins, 61, was taken to a Michigan City hospital on Monday night. She remained in the intensive care unit early on Wednesday. She was treated for an overdose of a prescription drug. Bivins, 41, had waived all appeals and said he wanted to die. He was pronounced dead at 12:26 a.m. CST at Indiana State Prison in Michigan City, the Indiana Department of Correction said. Earlier he had consumed a last meal prepared by his mother in the prison kitchen under supervision. Prison officials said it was the 1st time the state had granted a condemned inmate's request for a final meal cooked by a family member. Last week Bivins told a news conference death was a "way to escape the abuse and frustration ... spending my life in prison does not appeal to me. The only thing that can come out of it is anger and frustration." "I wish to apologize to the victim's family for the pain I have caused and the pain I have caused my family and friends,'' Bivins said in a final statement; "and I ask that they, who did this to me, be forgiven." He was convicted of killing the Rev. William Radcliffe, a Protestant minister who ran a rehabilitation program to which Bivins, then on parole, was assigned. Radcliffe was killed during a robbery at an Interstate highway rest stop in January 1991 after the minister recognized him, Bivins later said. He and 2 companions had been on a 2-day crime spree at the time. Bivins becomes the 1st condemned inmate to be put to death in Indiana this year and the 8th overall since the state resumed capital punishment in 1981. Bivins becomes the 19th condemned inmate to be put to death this year in the USA and the 702nd overall since America resumed executions on January 17, 1977. A 41-year-old man convicted of killing a minister at a highway rest stop was executed by injection early Wednesday morning. Before he died, Gerald Bivins pleaded for forgiveness for himself and those who put him to death. "I wish to apologize to the victim's family for the pain that I've caused them and for the pain that I've caused my family and friends, and I ask for their forgiveness. And I ask that those that do this to me be forgiven," he said. Bivins was condemned for killing the Rev. William Radcliffe during a robbery at a rest stop along Interstate 65 north of Indianapolis in 1991. He declined to exhaust his appeals, saying he was tired of prison life and frustrated. Authorities called the murder a thrill killing, but Bivins said he killed the minister only because the victim had recognized him during a robbery. "I'm not trying to excuse it. Honestly, I don't think that makes it any better than one who did it to see what it feels like," Bivins had said. Death penalty opponents had urged Gov. Frank O'Bannon to commute Bivins' sentence to life in prison. They questioned the governor's decision to allow the execution while a commission studies the fairness of Indiana's death penalty. But O'Bannon said he would not intervene because Bivins had abandoned his appeals and because members of the commission have not discovered any problems with the death penalty. The commission's report is due this summer. I spent much of last week at the Indiana State Prison where I served for 4 years as a volunteer chaplain. I returned there at the request of Jerry Bivins, a man on death row whom I came to know well. Jerry was executed shortly after midnight on Wednesday, March 14th. He asked me to serve as his spiritual advisor and to witness his execution. The events of his last days underscore for me, the devastation that this penalty inflicts, upon all involved-- victim's families, prisoner families, other prisoners, attorneys, friends, and corrections officials. No one was left untouched by the inhumanity that was done in Indiana last week, whether they want to admit it or not. Jerry's execution also underscores for me the raw dishonesty with which the state talks about the death penalty. Jerry Bivins' execution helped no one, served no purpose, except to provide a target for our own projected hatred and vengeance. Those politicians, prosecutors, presidents, and citizens who speak of the death penalty with words like deterrence or retribution or public safety or justice are lying. And that lie needs to called what it is. It is not merely a difference of opinion, another view, a varied perspective. To suggest that the death penalty does anything more than brutalize all involved is to tell a fatal lie, a lie that will cost lives as long as it is believed. A friend of mine, who knows the corrections system in Indiana well, wondered to me recently about how we speak against the death penalty while trying not to offend anyone. For me, that veneer of manners needs to end. The death penalty itself offends every sensible person. To suggest otherwise is to collaborate in a false civility that degrades us all. I arrived at the prison on Monday morning, March 12th. My plan was to spend as much of the day as possible with Jerry, his family, his friends, as the execution was scheduled for the next night. Along with Fr. Paul LeBrun, the catholic chaplain at the prison, I went to the death row unit where Jerry and I had our first brief visit. It had been about 10 months since I had seen Jerry. Let me say some things about my friendship with him. 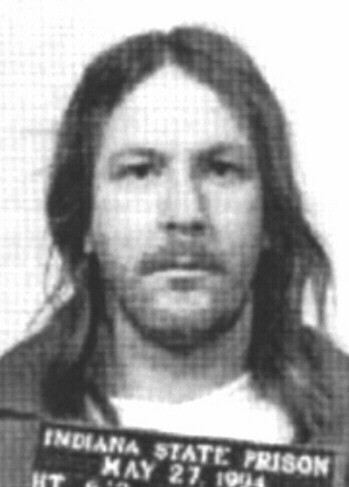 Jerry Bivins was sentenced to death in 1992. He came to death row after being convicted of murdering Rev. William Radcliffe at a roadside rest stop washroom in Lebanon, Indiana. Jerry was born and raised in Evansville. For most of his teens and twenties he was addicted to alcohol and various drugs. It was while drunk and strung out that he and two other men sought to rob the man who came into this rest stop washroom. When Jerry realized the man coordinated a substance abuse clinic Jerry had once been part of, in a stoned frenzy he shot him. After being convicted and sentenced to death, Jerry came to death row where he learned to sharpened his writing skills. He began to develop both his intellectual life and his spiritual life. These were, by his own admission, the first adult years he spent mostly sober. With a man in Florida name Hugo Boniche, Jerry co-founded a publication called "The Death Row Forum." This magazine style publication sought to publish the writings of men and women on death row. The "Forum" ran for about 4 years. At its peak it had a subscription list of about 100 readers. Jerry also began to grow spiritually. He had been baptized in a pentecostal church as a child but virtually never practiced any faith. When I came to the prison in 1996, we began to talk often about faith. Jerry had a hungry mind and heart. He was eager for answers to ultimate questions. Those questions culminated in his being received into the Catholic church and confirmed as an adult catholic in 1999. Those of you who have been reading Prison Reflections in the past will recall the description of his confirmation in the death row visiting room. It was a moving and prayerful experience. Sr. Gerald Ann, a Holy Cross nun he was writing to, Karen Luderer, his friend from Pennsylvania, Fr. Joe Lanzalaco, at the time the other prison chaplain, were all present. Jerry was a man of wild humor. You might remember it being described here before, that often when I would enter his section of the death row building, he would shout jokingly to the others: "Brother Joseph on the set, make like you're asleep!" Then he'd sit back and laugh, waiting for me to walk up to his cell scowling. I arrived at his cell shortly after 9am on Monday morning and we hugged with the black, steel bars between us. Immediately he pulled a chair over to the bars, I pulled a milk crate over and we sat down in the same way we had hundreds of times. The first thing he said to me was: "You going to be ok with this? You going to make it through this?" I told him I would. We talked for about 15 mintues. I told him I would do whatever he needed me to do. "Keep me grounded," he said. He had several visits scheduled for the day so he said he wanted me to sit with him between visits and to help him prepare his family for the execution. We read from Luke's Gospel, the story of the man on the cross, executed next to Jesus. We would end up reading this passage many times in the next 2 days. For the rest of that day, Jerry visited with his brother, sister-in-law, mother, and other friends. I would sit with him in between visits. Plus, I would come into the death row visiting room sometimes, toward the end of visits, as they became very emotional. I would often just put my hand on Jerry's back, as he hugged this friend to whom he was saying goodbye. That evening, his mother, brother, sister-in-law, and a friend of his mother's, cooked his official last meal and they brought it to the death row visiting room. This was one of those beautiful yet surreal moments in prison. Fr. Paul, Jerry's mother, brother, sister-in-law, and I sat in the death row visiting room, a giant cage really, and ate a wonderful meal of chicken and dumplings, German ravioli, and vending machine sodas. We laughed, cried, told stories, laughed some more, and complimented Jerry's mother on the dinner. Jerry described it "without a doubt, the best meal he'd had in 10 years." At the end of the meal, Jerry's brother got up, went around to where Jerry sat, got Jerry up, and they just held each other and cried. Jerry's mother did the same and the goobyes were long and tough. We all agreed to meet the next morning at 9am. After Jerry went back to his cell, I went to visit his 3 close friends on the Row: Mike, Chuck, and Gamba. I relayed to them the message Jerry asked me to relay to them, as he would not see them again. I told them each that Jerry said he loved them, held them in his heart, and then he had a special message for each of them. For Mike it was: "Take care of your son." For Gamba it was: "Keep reading and praying." For Chuck it was: "Stay out of trouble." These men received these messages each in his own way. But Chuck especially took it hard. I had never seen Chuck show a lot of emotion before, except for anger. He's a pretty tough guy. His eyes filled with tears and he leaned toward me against the bars and sobbed. I just tried to hold him through the bars, as well as I could. Grief is an odd thing on death row. When someone is executed, others go through a mix of things: sadness on losing someone they may love, fear from wondering when the state will do this to them, and anger that the one dying is likely, perfectly healthy. This grief is like no other I have known. The next morning I met Fr. Paul again and we met Jerry's brother as he arrived at the prison alone. He looked a little agitated so I asked him where his mother was. He told me that she had an accidental overdose of pills the night before and was in St. Anthony's Hospital. He said she would be alright but that he would tell Jerry that she had fallen. This would likely mean of course, that she would not see Jerry alive again. We went into the prison and Rick went to the death row visiting room. I went into the death row unit to see Jerry. He was getting ready to go out to see his brother. We prayed once again. Jerry said real goodbyes on this day. He said goodbye to his brother, sister-in-law, and 2 friends, Dan and Karen, who had been faithful friends to Jerry for most of his years in prison. Again, I spent the day in and out of the visiting room as their goodbyes took place. All gut-wrenching and sad. Sometimes I would sit with Jerry after the friend had left. Other times he asked me to walk them out and sit with them out front for a while. Once while he was visiting with someone, I was in the death row unit visiting some of the other men and a prison administrator called me down to the guard's station. He told me that had the prison learned of a mother's suicide attempt regarding any other inmate, they would have to tell that inmate. I told him that it would be best for Jerry's brother to tell him, though I knew he didn't want to. The administrator said that would take too long as he couldn't call his brother until later in the evening from the holding cell. When I said I was hesitant to tell Jerry, he said he would have to order the prison's official chaplain to come to Jerry's cell to tell him. Knowing that Jerry did not get along with this chaplain, and that I had never in 4 years seen that chaplain on death row, Fr. Paul and I decided it best if we told Jerry. He came back from his visit and we sat outside his cell and told him that it seemed his mother had taken 50 Xanex pills, but that she would be alright. Jerry was not agitated, just frustrated that his brother did not tell him the whole story. I should add that this is a common dilemma for prisoners' families. Not wanting to worry their prison-relative, often families don't tell a prisoner the complete truth about a loved one. Jerry was frustrated, but understood why his brother did this and he knew he'd have a chance to heal this with his brother later on the phone. Jerry was just worried about his mother. And he felt utterly responsible for her suffering. As a side note, the official Department of Corrections spokeswoman told the press that Jerry was "angry" at his brother. This was not true. Even if it were true, the fact that she announced that to the press, knowing full well that Jerry's family would see this comment, was to my mind, unprofessional and inappropriate. However, it was untrue. He said to me that he was frustrated. Never did he show anger at his brother. Thankfully, I was able to clear this up with his brother, but 2 days after Jerry's execution. Around 4pm Jerry had a last visit with his lawyer and he returned to the death row unit. The protocol takes over from here. Jerry was given time to take a shower and a clean set of clothes. He was able to walk the range and say goodbye to a few other prisoners, though his close friends do not live in that range. I am not allowed to walk with him from the death row unit to the death house, so Fr. Paul and I had to go wait in the chapel until Jerry was secured in the holding cell, next to the lethal injection room. Fr. Paul and I sat in the chapel until called over to the death house. We entered this old, brick building across the prison's "Main Street" from the chapel. We entered a long hallway, through a door of bars, down another long room, at the end of which is the window through which the witnesses watch the execution. We were taken right into the lethal injection room, though the gurney was surrounded by a curtain, and into the holding cell's room. This room is roughly 10 by 10, with a cell built into one wall. Jerry was sitting on a mattress inside the cell and outside the bars was a line on the floor, about 2 feet from the bars. There were 2 guards at a table with a phone. They announced that I could not cross the line and not touch him. I told the guards that was not acceptable. That in fact, just the day before I had spoken with the warden who assured me there was no line (I had the same battle the last time I served as a spiritual advisor) and that Jerry and I could touch. The officers said these were their orders. I told them to call the warden immediately. Jerry, enjoying the fact that it took less than a minute for me to have a conflict with the guards, just sat on the mattress and smiled. I pulled a chair up right to the edge of the line and waited for them to call the warden. Jerry and I talked for a few minutes and when the guards got off the phone they said I was free to ignore the line and to touch the prisoner. It was now about 5pm and we would be there until roughly 10:45pm. We agreed that he would make some phone calls and that we would talk between them. We also agreed that we would give him communion and pray around 8:30pm and then anoint him and pray before Fr. Paul and I had to leave, around 10:30pm. Jerry was very relaxed. He drank some pepsi, was allowed to smoke Camel Filters, called some friends, including his brother. When he was not on the phone, I would pull my chair right up to the bars and we would talk. He, Fr. Paul, and I had some laughs, tears, handled some details of his last possessions. Jerry and I had a little ritual. He would say goodbye to whichever friend he was phoning, and this truly was goodbye. Then I would hang the phone up for him. I'd ask: "How is Karen?" He'd say: "She's tore up." I'd then say: "How's Jerry?" He'd respond: "He's ok." Jerry had a deep sense of God's forgiveness. He knew he had expressed sorrow for all his sins. He knew he had spoken his apology to the Radcliffe family and that there was nothing more for him to do except to trust in God's mercy. He said to me that one thing he loved about the catholic tradition was that you could always count on Mary to help you get saved. Jerry referred to Mary as "the back door." He would say: "If you can't get in the front door, you go to Mary at the back door. She'll get you in." Jerry had a beautiful conversation with his niece, who had just given birth to a child in Evansville. She was in her hospital bed and he was in the death house's holding cell. She was nursing her newborn child. He awaited execution. The contrast was clear to all of us. He urged her to take care of her children. She apologized for not being there with him. He reminded her that she was in the right place. They both laughed and cried. Around 8:30pm Fr. Paul gave Jerry his last communion, also called Viaticum. Fr. Paul spoke of this last communion as "food for the journey." He reminded Jerry of the many times Jerry had received communion on the Row. He told him that this time would be the last and that soon he would be in the Father's embrace. One awkward, but beautiful moment took place here. Fr. Paul told Jerry that with the Viaticum, came an apostolic pardon. Jerry asked what that was. Fr. Paul explained that this was a special forgiveness from the Pope for one's sins. Jerry, confident in God's forgiveness said rather quickly: "I don't need that. I have all I need." I was gratified in Jerry's quick response in that it seemed to show that he, in fact knew, deep down, that God had forgiven him. That there was nothing else needed. Jerry made a few more phone calls as the night wore on. One last call was to his brother, against whom he had no frustration. They had already spoken once that night and he said they had soothed any remaining differences. No problems. More tears. More joking. At one point, I was sitting up against the bars and he, sensing that things were getting too serious told me he had a lump on his jaw and would I feel it? I reached in the bars and he quickly acted as if he were going to bite my hand. Startled, I pulled my hand out quickly and he laughed and laughed. With Jerry, there was never a moment too serious for a joke. Before our last prayer, I reminded Jerry about his last statement. We had talked about this earlier and he knew exactly what he wanted to say. I suggested that he write it down and give it to me so it would reach outside exactly as he wanted it. I handed him a pen and paper and he wrote down these words, which he had carefully memorized. "Last Statement. I know that I have hurt a lot of people in my life, especially my family and the Radcliffe family. I am sorry for the pain and sorrow I have caused Karen and Matthew Radcliffe, my friends and family. I ask that they forgive me. And to those here at the prison, I say 'Father forgive them, for the know not what they do to me.'" He asked me if I thought that was alright. I told him it was beautiful. That it was exactly the right thing to say. He was very pleased. I told him also, as I did many times, that while asking for forgiveness was the right thing to do, the crime that landed him on death row was not the entirety of his life. I said, "Jerry Bivins is a lot more than that one act." I reminded him that he was deeply loved by his family and friends. I said "You're funny and thoughtful and caring and gentle." He just smiled. "Yeah." Around 10:30pm we gathered again to pray. We read the prayers of blessing for a victim of oppression. We prayed Psalm 145, read of Jesus on the cross in Luke's Gospel. We heard the man on the cross next to Jesus ask Jesus to "remember him." Jesus responds: "Today you will be with me in paradise." We said to Jerry emphatically, that tonight those words are addressed to him. That God's love for him is so great, so willing, so ready, that this very day, he will be with God in paradise. We all sensed that goodbye was coming. We took the Sacred Chrism, and explaining that it was used for the strengthening of kings, prophets and priests, I generously anointed Jerry's forehead and hands. "You are ready. This very day you will be with me in paradise." Shortly thereafter, another guard came into the room and told Fr. Paul and I that it was time for us to leave. This was around 10:40pm. This gives the prison officials the opportunity to put Jerry on the gurney and to keep the execution team's identity confidential. I went up to the bars, Jerry stood up, he thanked me, told me he loved me. I told him I also loved him. That if he needed to see someone who loved him during the execution that he should look at me. That he should keep the words: "Jesus remember me" on his lips. I also told him that I was honored to know him and to walk with him. He just nodded his head and cried. Finally I asked him: "Tell God we all did our best." He smiled and said to me: "He knows you did." Fr. Paul and I turned and walked out. I looked back only to see Jerry re-tracing the cross of oil on his forehead. We walked out and the guards locked the doors behind us. Fr. Paul and I were taken out into the cool night to join the other witnesses. We had to stop on the way to the front of the prison. The prison in the middle of the night was so quiet, so still. Paul and I both just stood there on that prison sidewalk, our hearts breaking. We finally joined the other witnesses, who included Jerry's brother and Bishop Dale Melczek, the catholic bishop of the Diocese of Gary, in which the prison sits. Eventually, we were all taken to the chapel where we waited some more. We spoke about setting up Jerry's funeral in Evansville. I told Jerry's friends and brother that he was in good shape, had prayed, was strong and ready. At around 12:20am a guard entered the chapel and told us to come with him. We were taken back to the death house, passed several barred doors to the room where 3 rows of chairs were set up in front of a window that looked into the death chamber. The window blinds were drawn. We sat there for a few minutes surrounded by several guards until the blinds snapped open. Jerry was lying on the gurney with an I.V. inserted into his left arm, which was hanging off the side of the gurney. His glasses remained on. He looked toward us and smiled. His arms were strapped to the gurney but he still managed a small wave of his left hand, from which still hung a handcuff. He continued looking at us. It was difficult to tell when the actual injections began. Jerry's head remained looking through the window at us. After a couple of minutes of stillness, Jerry coughed hard and seemed to be choking. Some of the witnesses gasped and Jerry convulsed and gagged and strained against the straps. Finally he stopped and was still. His head was straight and his mouth wide open. I continued to pray, others were sobbing, after about 8-9 minutes of the blinds being opened, they again snapped shut. A guard told us to stand. Bishop Melczek stood and made the sign of the Cross toward the window. Except for sobs, we were silent. We were escorted out of the building into a van. The van drove us out of a prison side gate, past a hearse. They dropped us off in the prison parking lot. There was a small gathering of vigilers and news people under the glare of television camera lights at the front of the prison. I said goodbye to Jerry's brother, told him I would call him the next day. I hugged Fr. Paul and thanked him for all he had done. I told Bishop Melczek that I intended to speak to the press and I asked him if he would join me. He did. We walked toward the gathering and the Department of Corrections spokeswoman had just finished her statement. Bishop Melczek and stepped right in front of the cameras. I told them I was Joseph Ross, one of Jerry Bivins' spiritual advisors. I introduced Bishop Melczek. I read Jerry's last statement and added that he went to his death with courage and honesty and humor. I added that his crime was not the total of his life, but that he was loved as a son and brother and friend. And that many of us would miss him. The reporters asked a couple of questions which I cannot recall. Bishop Melczek then spoke very eloquently about Jerry and his faith. The bishop thanked all those who work against the death penalty and said we had to step up our efforts so that this would not happen again. Bishop Melczek reminded those present that Jerry was a good man, was a brother to us all, and that we should all pray for him and work to end this penalty. From there, the crowd dispersed in silence. It was around 1:15am. Let us increase every effort to end this penalty in this country. Let us hold in prayer all victims of violence, all prisoners, their families and friends. Let us especially remember Jerry Bivins, his mother, his brother and sister-in-law, his friends in prison, his niece, and the many people who love him and miss him. Bivins v. State, 642 N.E.2d 928 (Ind. 1994) (Direct Appeal). Special Judge, of murder, robbery, confinement, auto theft, and two counts of theft. Defendant was sentenced to death and he appealed. The Supreme Court, Dickson, J., held that: (1) trial court's consideration of nonstatutory aggravating factors in sentencing defendant to death violated provision of state constitution requiring that all penalties be proportionate to nature of the offense; (2) victim impact statement of murder victim's wife was irrelevant and inadmissible; and (3) trial court's unconstitutional consideration of nonstatutory aggravating factors in sentencing defendant to death was harmless beyond a reasonable doubt. Affirmed in part and remanded in part with directions. Shepard, C.J., concurred in part and filed opinion. Sullivan, J., concurred in result and filed opinion. defendant, Gerald W. Bivins, was convicted following jury trial of six crimes committed during a two-day central Indiana crime spree in January of 1991. As a result, he was sentenced to death for the murder of William Harvey Radcliffe and consecutive terms of twenty years for one count of robbery, twenty years for one count of confinement, three years for one count of auto theft, and three years for each of two counts of theft. His direct appeal to this Court presents various issues which we regroup and address as follows: 1) physical restraint at trial; 2) admissibility of defendant's statements; 3) loss or destruction of evidence; 4) evidence and instruction regarding escape; 5) merger of offenses; 6) constitutionality of Indiana's death penalty statute; 7) death penalty aggravator as double jeopardy; 8) penalty phase instructions; 9) failure to find and weigh mitigators; 10) use of non-statutory aggravators including victim impact evidence; and 11) nature of relief to be afforded. Although we find that Count IV of the information, charging money and bank card theft, is merged with Count I, charging robbery, we affirm the remaining convictions and conclude that a sentence of death is proper and appropriate. ummary of the evidence begins with the evening of January 16, 1991, when the defendant and two other men, Ronald Chambers and Scott Weyls, stopped at a Lazarus Department Store in Lafayette, Indiana, where the defendant stole blue jeans. The men avoided apprehension by pointing a gun at a security guard. After two intervening stops, the three men drove to a Holiday Inn in Lebanon, Indiana, where the defendant and Chambers forced their way into a guest room occupied by Kevin Hritzkowin. The defendant and Chambers pointed their guns at Hritzkowin's head and body; ransacked his room; took his cash, credit card, and van keys; threatened to kill him; struck him on the back of his head; and tied him to a bathtub railing. The defendant then drove from the Holiday Inn in Hritzkowin's van, shortly thereafter parking the van and rejoining Chambers and Weyls in the defendant's wife's car. The three men then headed back toward Lafayette and stopped at an interstate highway rest area just north of Lebanon. There, the defendant and Chambers confronted Reverend William Radcliffe in the public restroom and announced a robbery with their guns drawn. Reverend Radcliffe cooperated immediately, giving the men his wallet. The defendant turned Radcliffe around, pushed him into a stall, and fatally shot him in the head. As they were fleeing the rest area, the defendant told Chambers that he had shot Radcliffe because he wanted to know what it felt like to kill. The next day, he also reiterated this to Weyls. In the ensuing days, the defendant attempted to conceal his role in the crimes. He burned the shoes he had worn, believing them to be blood-stained. He had the inside of his wife's car cleaned. He discarded the fruits of his robberies in a dumpster near his home and threw the gun and the car's license plate into a creek. Following the events of January 16, 1991, the defendant was arrested on February 20, 1991, in Lafayette on an unrelated Carroll County forgery charge. The defendant was read a standard advice of rights form and a waiver of rights form, both of which he signed. He did not ask and was not told whether he would be questioned about any crimes other than the forgery charge. Following the taking of a recorded statement regarding the forgery, the defendant was asked if he had any knowledge regarding other crimes, including the robberies and murder in Boone and Tippecanoe counties on January 16. The defendant offered to provide information about the caliber of gun used to kill the minister, the precise location of the murder, and various other crimes, including a Lazarus shoplifting. The defendant argued at trial that the advisements only covered the questioning about the Carroll County forgery charge and did not establish his waiver of rights to be questioned about the offenses in Tippecanoe and Boone counties. He asserts that he did not knowingly, intelligently, and voluntarily waive his right to silence in regard to those crimes and that the resulting evidence, part of the burnt tennis shoe and a photograph thereof, were erroneously admitted as evidence. A suspect's awareness of all of the possible subjects of questioning in advance of interrogation "is not relevant to determining whether the suspect knowingly, voluntarily, and intelligently waived his Fifth Amendment privilege [against self-incrimination]." Colorado v. Spring (1987), 479 U.S. 564, 577, 107 S.Ct. 851, 859, 93 L.Ed.2d 954, 968.e also note that the advice of rights and waiver forms read to and signed by the defendant specifically advised him that even if he decided to answer questions immediately without a lawyer present, he still had the right to stop answering at any time. Reviewing the circumstances surrounding the waiver and the ensuing statements by the defendant, we find that his conduct was not the product of any violence, threats, promises, or other improper influence. The trial court did not err in overruling the defendant's objections to evidence resulting from the February 20, 1991, statement following his arrest on the Carroll County charges. On the day after his arrest, February 21, 1991, the defendant was taken from the Carroll County Jail to various locations in Tippecanoe County so that the defendant could show police investigators where evidence from the crimes of January 16, 1991, had been discarded. Detective Brown testified that he did not readvise the defendant of his Miranda rights before going on the search because the excursion was "a continuation of the interview from the night before." Record at 3438-42. The detective believed that since the police were not asking the defendant any new questions or taking a formal statement, but merely having the defendant show them the location of the gun discussed the night before, it was not necessary to readvise the defendant of his rights. The police and the defendant looked for the gun but were unable to find it. One week thereafter, however, a gun, later determined to be the murder weapon, was found at the location identified by the defendant. At trial, the defendant objected to the admission of any testimony about what he told police on February 21 and the resulting evidence on the grounds that he had been in police custody and had been subjected to questioning without being advised of and waiving his Miranda rights. On appeal, he argues that we apply the following standard of review: We have held that if at the commencement of custodial interrogation the suspect has been given an advisement and made a waiver in accordance with the guidelines in Miranda, that advisement need not be repeated so long as the circumstances attending any interruption or adjournment of the process is such that the suspect has not been deprived of the opportunity to make an informed and intelligent assessment of his interests involved in the interrogation, including the right to cut off questioning. Partlow v. State (1983), Ind., 453 N.E.2d 259, 269 (citation omitted), cert. denied, (1984), 464 U.S. 1072, 104 S.Ct. 983, 79 L.Ed.2d 219. The defendant urges that the relationship and passage of time between the initial reading of rights and the subsequent search for physical evidence the next day were too tenuous and too great, respectively, and deprived the defendant of the opportunity to make an informed and voluntary waiver of his rights. The State responds that because the defendant had told police the night before that he could show them where the gun was, the intervening time prior to the next day's search was not such that Defendant was deprived of the opportunity to make an informed and intelligent assessment of his interests. We agree. The daylight resumption of the prior night's search for items named that same evening by the defendant did not require a renewed advisement of rights. The trial court did not err in overruling the defendant's objections to the evidence resulting from the February 21 search. Later on February 21, 1991, in Lafayette, the police taped a statement from the defendant after he was readvised of his Miranda rights. The defendant stated that he had helped two men, Jamie Warren and Kevin Robertson, attempt to use stolen credit cards and dispose of some stolen property. Claiming that Warren and Robertson had confided the particulars of their crimes to the defendant, the defendant related in great detail the stories of the robberies and the Radcliffe murder. [FN2] By February 25, 1991, however, the police had established that neither Warren nor Robertson could have committed the murder. FN2. On February 22, 1991, the defendant testified at a probable cause hearing for the arrest of Warren and Robertson for the murder and robberies of January 16, 1991. [Sheriff Hudson] I told Mr. Bivins that I had called the Prosecutor and that she was in the process of getting the Judge to appoint an attorney. That we would be leaving immediately and drive to the jail where he would have an opportunity to meet with the attorney. And the only statement that I made to him was that I would like to know who those two guys are. [Prosecutor McClure] Did Mr. Bivins say anything further to you before you left the post? [Sheriff Hudson] Yes, he did. [Prosecutor McClure] And what was that? [Sheriff Hudson] Well, then he first said that he wanted to talk to you. And I said, "That is fine, we're going to be en route right now." And he then said, "Are you sure that you're going to keep your word and that you're not lying to me, you're really getting an attorney for me?" And I said, "Absolutely, for sure." And that, "You can take my word on that. We're going to leave here and we're going to get you an attorney." And I again made a statement, "I'd like to know who those two guys were that were with you." And then he said, "Well, I want to meet with this attorney to negotiate." And I said, "Fine. That's where we're going right now. But I would still like to know who those two guys are." And then he mentioned one of the two other individuals' names at that time. [Prosecutor McClure] And who was that? [Sheriff Hudson] That was Scott Weyls. * * * * * * [Sheriff Hudson] As we were out in the hallway area getting ready to exit the building on our way to the parking lot, Mr. Bivins stated who the other or the second individual that was with him during the night of this crime spree. [Prosecutor McClure] And who was that? [Sheriff Hudson] Ronald Chambers. Record at 3278-80. The defendant contends that the trial court erred in permitting the State to place into evidence the defendant's recorded statement of February 25, asserting that it was involuntary because made under an unkept promise of leniency. After being transported from the Indiana State Police Post in Lafayette to the Boone County Jail, the defendant was allowed to consult with attorney Michael Gross, who had been appointed to represent him. The inculpatory portion of the recorded statement was preceded with the following express and recorded acknowledgement by the defendant: The above statement of my rights has been read to me and I am fully aware of those rights. I do fully understand those rights. I hereby acknowledge that I have, I at one time requested a lawyer and now have an attorney present. I further acknowledge that I have initiated this interview and that I have requested to make a statement. I am willing to make a statement and answer questions. This waiver of my rights has been knowingly and voluntarily made by me without any promises or threats having been made to me and further without any pressure or coercion having been used against me. Record at 3566-67. Mr. Bivins will be charged with robbery as a Class B felony as it relates to the Holiday Inn in Lebanon. That he will plead guilty straight up. In other words, that he will plead guilty with both defense and the State reserving the right to argue sentencing. * * * I, the Prosecutor, will talk if at all possible tomorrow with the Prosecutors in both Tippecanoe and Carroll County. I can do no more than represent that I will ask that they run concurrent any time for charges that Mr. Bivins may face there, which I understand to relate to forgeries in both of those counties. That's the agreement as I understand it to be. Record at 3568-69. The recorded statement later includes the defendant's statement that he participated in the Holiday Inn robbery, that he was at the interstate highway rest stop but outside the restroom when Reverend Radcliffe was murdered, and that it was Weyls who actually shot Radcliffe. In this appeal, the defendant contends that the State made an offer of immunity and leniency "to obtain Bivins' confession to having been a participant in the murder of Reverend Radcliffe." Brief of Appellant at 105. [FN3] He contends that the confession must be deemed involuntary and therefore not admissible because it was obtained by promises of immunity or mitigation of punishment. The defendant next argues that his statement of March 28, 1991, was not accompanied by a knowing and voluntary waiver of his right to counsel and therefore is inadmissible. On that date, the defendant asked to talk with Sheriff Hudson, who then read to him an advisement of rights form containing the statements "I at one time requested a lawyer, but now I wish to WAIVE that RIGHT" and "I have INITIATED this interview." Record at 3288. The defendant signed this waiver form. He then, for the first time, told the sheriff not only that had he had been at the rest area during the murder, but also that he had been inside the restroom at the time of the murder. The defendant now contends that his Sixth Amendment right to counsel was violated because he already had an attorney, his attorney was not notified, and he was not advised that his attorney would not be present. The defendant claims reversible error occurred with the admission of testimony describing his confession of April 10, 1991. On that date the defendant again initiated an interview, requesting from his jail cell to speak with a detective with whom he had been dealing, saying he wanted to confess to killing Reverend Radcliffe. The detective was called and arrived with a second detective about thirty minutes later. A tape recording was made of the detective reading the defendant his rights and the defendant orally reading the waiver section. The defendant then gestured for the detectives to turn off the tape recorder, which they did. The defendant indicated he wanted to make a complete disclosure and then admitted that it was he, not Weyls, who shot Reverend Radcliffe. The tape recording of the defendant's waiver of rights was not saved by police. The defendant finally objects to admission of his statement of April 11 confirming the truth of his statement to Detective Brown the previous night. He again argues that he was not re-advised of his Miranda rights. In this incident, the defendant asked to speak with the sheriff, who went to the defendant's cell and said, "You wanted to see me." Id. The defendant responded, "I just wanted you to know that what I told him last night was the truth." Record at 3660. We do not find the sheriff's response to the defendant's request to constitute an interrogation. The defendant's remarks were made freely, voluntarily, and spontaneously, and not in response to questioning. The sheriff was not required to give a new Miranda warning. This cause is remanded to the trial court for revision of judgment, to merge the conviction for Count IV, charging theft of money and bank card, with that for Count I, charging robbery, and to vacate the separate sentence for Count IV accordingly. In all other respects, the judgment of the trial court and the sentences, including the death sentence, are affirmed. Bivins v. State, 735 N.E.2d 1116 (Ind. 2000) (PCR). After his convictions for murder, robbery, confinement, auto theft, and two counts of theft, and sentence of death, were affirmed on direct appeal, 642 N.E.2d 928, petitioner sought post-conviction relief. The Boone Superior Court, James C. Detamore , Special Judge, denied petition. Petitioner appealed. The Supreme Court, Sullivan, J., held that: (1) counsel for defendant was not ineffective in investigating and presenting mitigating evidence during penalty phase; (2) counsel was not ineffective in failing to discover statements made to police by defendant's accomplices, and by wife of one of accomplices, as request for disclosure of all statements was made, and counsel had no reason to believe prosecutor's response to request was incomplete; and (3) statements by accomplices and wife were not material, so that failure to disclose statements did not result in violation of defendant's due process rights. Affirmed. Gerald W. Bivins seeks post-conviction relief from his convictions for murder and sentence of death arguing, inter alia, that his trial counsel did not adequately investigate and present evidence in mitigation of a death sentence. We affirm the post-conviction court's decision to deny post-conviction relief, including its determination that trial counsel did not render deficient performance in investigating and presenting evidence of mitigating circumstances. Gerald W. Bivins was convicted of murder, robbery, confinement, auto theft, and theft in connection with the killing of Reverend William Radcliffe and sentenced to death. We earlier affirmed Bivins's direct appeal of these convictions and sentence. See Bivins v. State, 642 N.E.2d 928 (Ind.1994), cert. denied, 516 U.S. 1077, 116 S.Ct. 783, 133 L.Ed.2d 734 (1996) . As permitted by Indiana Post-Conviction Rule 1, Bivins sought collateral review by filing a petition for post-conviction relief. This petition was heard in the Boone Superior Court and post-conviction relief was denied. Bivins now appeals the denial of post-conviction relief to this court. In this opinion, we will refer to the court in which Bivins was originally tried and convicted as the "trial court" and the court in which the petition for post-conviction relief was heard and denied as the "post-conviction court." We now turn to the post-conviction court's conclusion that trial counsel discharged their constitutional duty to investigate and present mitigation. Bivins vigorously disputes the conclusion, pointing to the failure to solicit health, education, and military records or to consult with members of Bivins's extended family. Br. of Appellant at 60-61. And he argues that the additional personal, family, and social history testimony that would have been available through other witnesses would have clearly placed him in a more sympathetic light and should have been presented and considered to the jury. Id. As suggested by the discussion in part I-A, there was extensive testimony at the post-conviction hearing concerning Bivins's personal, family, and social history. This testimony included information on his relationship with his mother, father, and grandfather; his relationship with his brother, playmates, and neighbors; the neighborhood in which he grew up; his academic, health, and military records; and his hyperactivity, discipline problems, and stuttering. The post-conviction testimony also included the reports of a psychologist and speech therapist who examined Bivins at the request of post-conviction counsel. After making findings of fact (many of which are discussed in part I-A supra), the post-conviction court concluded in part: 95. Counsel was not ineffective at the penalty phase for failing to investigate and present more evidence in mitigation. Counsel competently presented the testimony of Bivins, his relatives and former employer who collectively presented to the jury evidence about Bivins'[s] personal and family history, the family's history of alcoholism, his own problem with alcohol and drugs, his rebelliousness as a teenager and his potential to succeed with training as an industrial painter. Counsel cannot be branded as ineffective for not presenting more of the same type of personal, family and social history through other witnesses. Though there may be portions of Bivins'[s] school, health and service records that a defense attorney might attempt to characterize as mitigation, any mitigating effect of those portions is counteracted by the records highly unflattering descriptions of delinquency, criminal conduct and unsuccessful attempts to help him in the past, and the notable absence from those records of any diagnosis of substantial mental illness. 96. Much of Bivins'[s] personal history detailed in the post-conviction hearing relates to his childhood. The absence of such a detailed depiction of his childhood at the trial does not constitute ineffective assistance because neither the jury nor the judge are required to find a defendant's troubled childhood to be a mitigating factor. Lowery v. State, 547 N.E.2d 1046, 1059 (Ind.1989) [,cert. denied., 498 U.S. 881, 111 S.Ct. 217, 112 L.Ed.2d 176(1990) After all, Bivins was an adult when he intentionally murdered Mr. Radcliffe. 97. Counsel did not perform incompetently by failing to present Bivins'[s] history of stuttering as a mitigating factor. The problem was not severe. In any event, jurors heard him testify and heard recordings of his statement to police and could draw their own conclusions about the extent of his stuttering problem. Neither the jury nor the judge are required to find certain factors to be mitigating factors simply because there is some evidence in the record to support them. Bivins, 642 N.E.2d at 952. Stuttering does not mitigate his intentional killing of Mr. Radcliffe while robbing him. Speech pathologist Chunn's opinion that Bivins suffers from a central auditory processing disorder does not indicate ineffective assistance either. Like the opinion of Dr. Arnold, Chunn's opinion is admittedly affected by ongoing research and information not necessarily available in 1991-92. Further, she admitted she found Bivins to be very bright, confessed knowing very little about Bivins'[s] crimes and had no opinion concerning how his disorder would affect his crimes. This is hardly the type of mitigation evidence that would support condemning counsel as ineffective. We affirm the post-conviction court's denial of Bivins's petition for post-conviction relief.